-How to create an in-text citation with and without an author’s name. -How to lead into or out of a quote with the student’s own words. -How to pepper a quote. -How to delete parts of the quote to seamlessly incorporate the evidence into the student’s paragraph. -How to incorporate the title and/or author in signal phrases prior to a quotation. -Examples from quality literature for each type of citation. -Text Evidence Trouble-Shooting Guide teaches students to fix common mistakes such as orphaned quotes, transition phrases, summarizing instead of analyzing, and big, chunky quotes. Support and examples are provided through this document, and the lesson activity that accompanies it. Students are given three passages, one fiction and two non-fiction texts- with relating themes (social justice). They are asked to close read, then respond to the given prompt using evidence from two of the three sources. They are supported in doing so with detailed graphic organizers, and asked to seamlessly incorporate text evidence for the assessment. -Complete digital (and printable) interactive notebook for students. 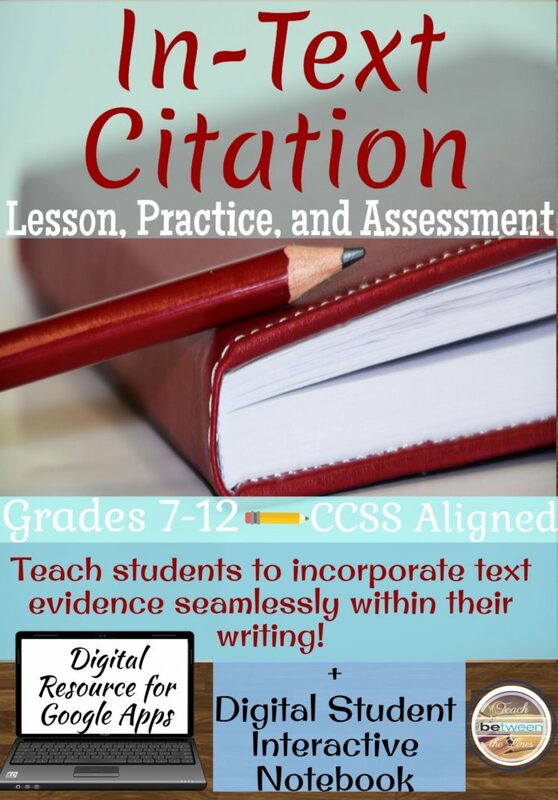 This is over 50 pages in length and will take students through the entire unit in one document for easy link and go- or print and go- teaching! Rhetoric- Ethos/Pathos/Logos Bell Ringer Activities!